A pipe is connected to a tank or cistern. It is used to fill or empty the tank; accordingly, it is called an inlet or an outlet. Inlet: A pipe which is connected to fill a tank is known as an inlet. Outlet: A pipe which is connected to empty a tank is known as an outlet. Problems on pipes and cisterns are similar to problems on time and work. In pipes and cistern problems, the amount of work done is the part of the tank of filled or emptied. And, the time taken to do a piece of work is the time take to fill or empty a tank completely or to a desired level. 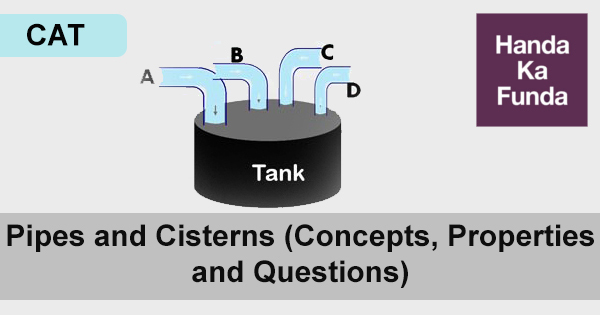 Example 1: A water tank has three taps A, B and C. A fills four buckets in 24 minutes, B fills 8 buckets in 1 hour and C fills 2 buckets in 20 minutes. If all the taps are opened together, a full tank is emptied in 2 hours. If a bucket can hold 5 liters of water, what is the capacity of the tank? Example 2: There is a leak in the bottom of the tank. This leak can empty a full tank in 8 hours. When the tank is full, a tap is opened into the tank which admit 6 liters per hour and the tank is now emptied in 12 hours. What is the capacity of the tank? Since the tap admits 6 liters of water per hour, it will admit (6*24) =144 liters of water in 24 hours, which should be the capacity of the tank. Example 3: Three small pumps and one large pump are filling a tank. Each of the three small pump works at 2/3 of the rate of the large pump. If all four pumps work at the same time, they should fill the tank in what fraction of the time that it would have taken the large pump alone? Three small pumps + one large pump = Three large pumps. Thus, if all the four pumps are open together, they would fill the tank in 1/3 rd of the time large pump would have taken alone. Example 4: A tank is fitted with 8 pipes, some of which that fill the tank and others that empty the tank. Each of the pipes that fills the tank fills it in 8 hours, while each of those that empty the tank empties it in 6 hours. If all the pipes are kept open when the tank is full, it will take 6 hours to drain the tank. How many of these are fill pipes? Therefore, there will be (8 – n) waste pipes. Each of the fill pipes can fill the tank in 8 hours. Therefore, each of the fill pipes will fill 1/8th of the tank in an hour. Hence, n fill pipes will fill n/8th of the tank in an hour. Similarly, each of the waste pipes will drain the full tank in 6 hours. ∴ each of the waste pipes will drain 1/6th of the tank in an hour. (8 – n) waste pipes will drain (8-n)/6th of the tank in an hour. Between the fill pipes and the waste pipes, they drain the tank in 6 hours. That is, when all 8 of them are opened, 1/6th of the tank gets drained in an hour. Note: The right hand side has a negative sign because the tank gets drained. The correct answer is Choice (2). Example 5: Pipe A usually fills a tank in 2 hours. On account of a leak at the bottom of the tank, it takes pipe A 30 more minutes to fill the tank. How long will the leak take to empty a full tank if pipe A is shut? Pipe A fills the tank normally in 2 hours. Therefore, it will fill 1/2 of the tank in an hour. Let the leak take x hours to empty a full tank when pipe A is shut. Therefore, the leak will empty 1/x of the tank in an hour. Now, when there is a leak, the problem states that it takes two and a half hours to fill the tank. i.e. 5/2hours. Conclusion: Most of the questions asked in CAT or other similar exams are of the same pattern as above from Pipes and Cisterns. If we remember the basic properties and have some practice on the above pattern of questions, these will be easy to handle in exams.